Watch the setting sun listening to sublime chill-out tunes from top DJs; have your first dance in a pre-club bar and then party the night away in one of the town's super-clubs. With a picturesque harbour, bustling sandy beach and palm-lined promenade that snakes all the way from the small Caló des Moro beach to the other side of the bay, San Antonio is not only a beautiful resort for holidaymakers, it is also the stepping stone to Ibiza's famous clubbing scene. While it has garnered a reputation as a party hotspot over the years, San Antonio is also a favourite with locals, who descend in the evenings and at weekends to take advantage of its excellent restaurant scene. San Antonio is home to an extensive range of bars, clubs and restaurants in the famous West End and the surrounding pedestrianised lanes, as well as on the lovely promenade. 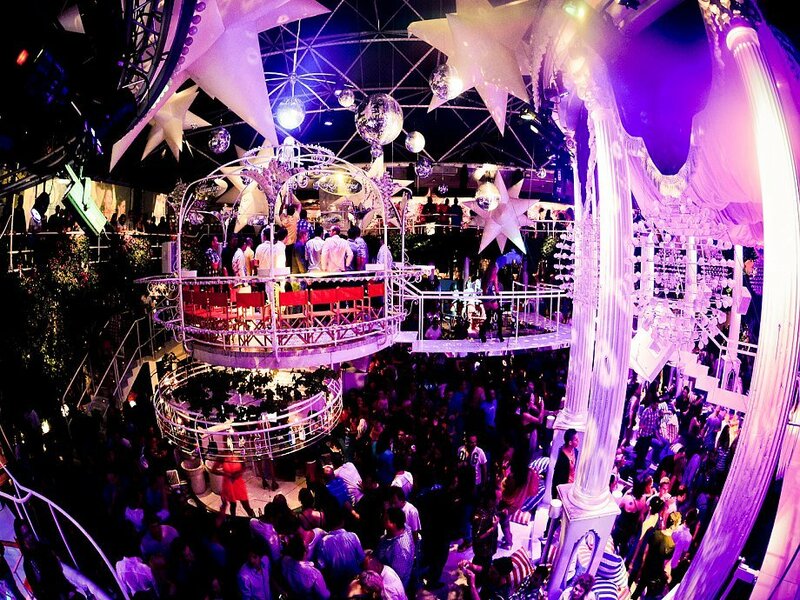 Ultimate clubbing can be found in the super-clubs Eden Ibiza and Es Paradis and in the open-air pool party venues O Beach Ibiza and Ibiza Rocks. In San An, you will find the famous Sunset Strip with the famous Sunset bars, undeniably a legendary spot on Ibiza and a rite of passage for anyone visiting the White Isle for the first or even the 15th time. The stunning sunsets are set against the brilliant blue sea and a kaleidoscopic sky, all enhanced by sets from world-class DJs playing in bars that line the promenade. The oldest of these, Café del Mar, is still a firm favourite, but these days it's also joined by an array of plush neighbours. All of them share the same prime position on this scenic stretch of bay coastline. The famous Café Mambo is now arguably the most well-known of the sunset cafes, thanks to its roster of internationally renowned DJs, every day of the week. Savannah is a slightly more low-key pre-party hangout as is Mint, which does an excellent fixed-price menu. Following the promenade at the end of the sunset strip, as you make your way further round the bay towards the small beach of Caló des Moro, there is a string of other sunset bars and restaurants. You are not limited on choice when it comes to cocktail spots with perfect vistas. The sunset strip isn't the only side of town with a wide selection of places to eat and drink alongside great views. The promenade that leads all the way to the main beach is also home to a huge range of bars and restaurants. At the end of the promenade you'll find the beautiful beach club O Beach Ibiza with parties around the pool and amazing sky shows. All of the venues and bars in San Antonio have their own unique energy, so whether you are looking to chill out on a hammock or dance on a podium in a swimming pool, there is something for everyone. While Eden and Es Paradis are right in the centre of San Antonio, Ibiza's other super-clubs like Amnesia, Pacha, Ushuaïa, Hi Ibiza and Privilege are all about 15-25 minutes away in a taxi, setting you back about 15-25€ a trip. Alternatively, you can catch the disco bus from the main bus station, from midnight onwards, costing a few Euros per journey and running every half an hour. If daytime clubbing is your thing, dance in or around the pool to tunes played by famous DJs, either in the Ibiza Rocks Hotel, unofficial 'home of the pool party', or in the O Beach Ibiza beach club on the promenade of San Antonio. Furthermore, make sure you hit one of the many boat parties that depart daily from San Antonio. Most of them sail into the sunset, all of them boast first-rate DJs, and each guarantees a truly unique experience. San Antonio is also set up to offer a full programme of daytime entertainment. On and in the water you can experience a host of activities like adrenalin-fuelled parasailing, speedboat tours, scuba-diving and much more. Boat trips take you to the beautiful beaches of the west coast or the sister island of Formentera. On land many excursions start in San Antonio, discover the beauty of the island in a real fun way, per jeep, vespa or quad. San Antonio has a wide choice of restaurants for each budget, offering a variety of cuisines. Dine in a sunset bar whilst watching the sky being bathed in spectacular colours, have a quick bite in the countless snackbars or enjoy a romantic evening with lush food. Rio Ibiza has a beautiful roof terrace to dine on, later you can sip a cocktail in the bar or try a first dance in the small club room. Also with great views of the harbour the elegant Villa Mercedes offers a Mediterranean-Fusion menu and daily live music. The famous tapas bar Rincón de Pepe right in the centre of town is one of the most traditional restaurants of San Antonio, a must for seekers of authentic flavours. For a British take on traditional Spanish tapas that is equally popular with tourists and locals, visit the Tapas Ibiza restaurant tucked away on Camino des Reguero. Along the promenade towards San Antonio Bay, enjoy a casual meal in a chilled out atmosphere at the Surf Lounge Ibiza whilst watching your friends riding the artificial waves. On the sunset strip you can enjoy the buzzing atmosphere in Cafe Mambo and Savannah and listen to the freshest tunes. Also with a great view of the sun setting into the sea, the Wi-Ki-Woo Restaurant offers tasty Asian-fusion food and great cocktails. San Antonio as a whole is a reasonably priced resort and offers a wide choice of apartments and hotels and hostels. There are many great value hostels in the centre of town, such as the traditional, family-owned Mari Hostel and the comfortable Florencio Hostel. There are also many self-catering apartments, budget ones for the money-conscious as well as more upmarket choices like the beautiful Cubanito Ibiza Suites in a colourful Art Deco style. Only a few steps from the famous sunset strip the Wi-Ki-Woo Hotel and the neighbouring Sol Bahía Ibiza Suites are perfect for urban travellers, both with lovely sea and sunset views from their chic terraces. Sophisticated clubbers also love the stylish Puchet Hotel in a quiet part of town yet only 10 minutes from the centre. A bit further along the bay the Marina Playa Apartments right at the sea also are a great choice for clubbers who want to unwind from the long Ibiza nights in style. Directly on Playa Pinet beach, the Sol House Ibiza offers fantastic in-house events on the spectacular roof terrace with stunning views over the bay. If you are coming in a group, we have a special recommendation for you: Treat yourself to your own private holiday villa; the price per person is a really good alternative to a hotel. The Bay of San Antonio is perfectly suited to those who want to be a little further away from the buzz of the town. A short walk from the centre, the bay has several quieter beaches offering water sports and beachside restaurants, and one of the best sunset spots in the west of the island, Kumharas restaurant and bar, where the attitude is so laid-back it is almost reclining. San Antonio has excellent bus connections to all the major resorts and to the airport, which is 20 km away. The disco bus connects all night to the major clubs, to Ibiza town and the clubbing resort of Playa d'en Bossa. There are parking areas and public car parks, both free and with charge, read more in our Holiday tips - getting around Ibiza. You'll also find several taxi ranks in town, taxi fares on Ibiza are quite reasonable, especially if travelling in a group. Read more about the resort and its beaches in our extensive resort guide for San Antonio.